Big B Agro understands how important quality fuel is to your farm operation especially during the hectic farming seasons. When you choose Big B Agro to power your farm operation, you are choosing a quality product at a competitive price with the service you deserve and can count on! Gasolines – Big B Agro offers two grades of gasoline. We offer a standard 87 octane gas that contains 10% ethanol, and for your older equipment and small engines and we also offer a 89 octane gas with no ethanol. Diesel Fuel – Big B Agro initially built its business selling Amoco’s “Premier Diesel Fuel” which was the industry’s standard bearer for many years. When that product was discontinued Big B Agro researched a way to continue marketing a premier fuel, and today all of our diesel products contain “Power Max.” Power Max is a multi-functional additive which creates truly the best premium diesel marketed in our area. Big B Agro proudly offers both 11% biodiesel and diesel fuel containing no biofuel. 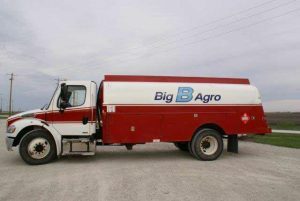 The Central Illinois farmer has come to appreciate and depend on Big B Agro’s delivery service to keep their operation moving. Big B Agro knows that even the slightest delay costs time and efficiency during the peak seasons, and we are committed to making on-time deliveries, every time! Big B Agro also understands that there are times when you get caught low on fuel and you are away from your fuel storage. For this reason we are happy to offer remote fueling to our regular fuel customers on a limited basis and for an additional fee.